The conjunction of Mars and Saturn can bring grief to people at large by becoming root cause of violence and uproar. Saturn and Mars both in Scorpio shall be causing havoc from 20th February till 18th September. The combination of these two malefic planets is an indication of a war in the western side of the world. This combination won't let the rulers sit in peace. As per Koorma Chakra system there are indications of probabilities of an increase in the terrorist activities in the western side of India in the region between IndoPak border and Central Asia. In addition to this, there is also Jupiter-Rahu conjunction happening during this time. Jupiter is the significator of religion, wealth and ethics whereas contrary to it Rahu is a demonic planet. Both these planets form Guru Chandaal Yoga which can bring downfall in the moral values in society and the prevailing political traditions also get destroyed. There is aspect of Saturn on this Jupiter-Rahu conjunction which can cause global boom, political upheaval, an atmosphere of war and chaotic situation in India and several other countries. On the other side if we analyze the situation of western countries then especially America might become target of terrorist attack as its ascendant is Leo. The western countries might go through a situation of emergency which would refresh the memories of 9/11. Further, there can be collision at its class between Korean countries. The main powerful countries of world might exhibit double standards while controlling ISIS. The tension among countries like America, Saudi Arabia, Syria and Russia can create possibilities of war in West Asia. In addition to that the probabilities of drought can also not be ruled out because of extreme heat. As per astrological text Bhavishyaphal Bhaskar - मंगल शनि वक्रै हुई, जगत पीर सब थाई। अल्प मेह दुख राजा को, घनी चलत जग बाई।। It means that whenever Saturn and Mars both are in retrograde motion simultaneously then they can together bring negative results like war, drought, less rains and troubles to life. Coincidently Mars and Saturn both shall remain retrograde in the whole season of summer. The above planetary position can create probability of earth quake on equator on 26th June 2016 and in northern hemisphere on 16th October 2016 however its intensity on Richter scale won't be more than 7. This year Venus shall remain combust from 2nd May to 1st July because of which there shall be non-availability of auspicious Muhurats. 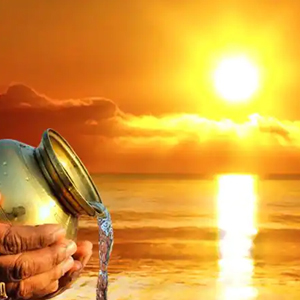 Since Venus is also the king of Vikrami Samvatsar 2073, there shall be anarchy along with increased suffering of common man during the combustion period of Venus. Impact of Planetary Combination on Various SignsAries- Saturn-Mars's conjunction in 8th house from your Rashi can affect your health as a result of which your anger, aggression and irritability etc. might increase. You might get cheated financially. You would be curious to know about occult powers. There shall be sudden obstacles on the final step of success. On educational front you might not get expected results and the probability of difference of opinion with children can also not be ruled out. Taurus- Your enemies might become headache for you. There can be sudden obstacles in the development of your destiny. The expenditure on travel might go useless. Probability of your facing legal and health issues can also not be ruled out. You might complain about waist pain. 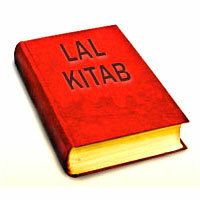 Be cautious in financial transactions and abstain from taking loan. Your relations with life partner might get deteriorated. Sudden eruption of tension & anger might affect your marital bliss. Gemini- Saturn Mars's conjunction shall be auspicious for you. You shall get auspicious results in areas like health, business and job with happiness on all fronts. If you are in job you can expect to get a job of choice. There are indications of getting new good job. There shall be progress in education. You might get cheated in business. You can expect fulfilment of your desires. For you up to some extent it is going to be a favourable transit. Cancer- You might have to face serious disputes in matters related to property. Your children might bring disappointment to you. There shall be bigger trouble in the condition of your family. You might get injury in your knees. You might complain about problem of breathlessness. There would be some difficulties at your area of work. Your confidence level is going down so you are advised to keep your patience intact. Leo- Your happiness and peace might get affected. You might have to lose your health so look after yourself. Be cautious in matters related to wealth and property. You are advised to be especially cautious while involving yourself in bigger financial transactions. Do not trust people blindly otherwise you might land into some trouble unnecessarily. You might have to face some difficult situations during this time because of which you might remain distressed. Look after your mother's health. Virgo- For you Mars-Saturn conjunction shall yield auspicious results. Your relations with your friends, siblings and relatives might get strengthened. The health of your partner might get affected. Some old disputes might cause tensions in your relations. Unnecessary expenses are indicated. The increased expenses shall make you anxious. Your saved wealth might decrease. Educational success is indicated. Libra- For your Rashi, Saturn-Mars conjunction would be yielding mixed results. You might have to go through trivial mental tensions and troubles so you are advised to keep your patience intact. Sudden financial gains are for sure. This SaturnMars conjunction can make you over enthusiastic and aggressive therefore work with patience. Your working efficiency shall be at its best. Your social reputation shall get enhanced. Scorpio- This time period is not so good for your health. Your over confidence might spoil your relations. You might lose the trust of your friends because of your adventurous and stubborn nature. Work sensibly to abstain from disputes however; this combination is auspicious for getting substantial betterment in your area of work. Your daily schedule might become hectic. There are some probabilities of going on abroad tour too. Sagittarius- Saturn-Mars's conjunction shall affect your health and mind. Try to control yourself. Your destiny is not supporting you completely. You shall be facing obstacles in accomplishing auspicious tasks and that is why you shall remain in tension. You shall have to work very hard for the fulfilment of your aspirations. Opportunities for gains are not much. There shall be difference of opinion with siblings. You might go on long journeys during this time. Capricorn- This time period is highly favourable for the expansion of property and earning gain from it. You can generate gain from landed property and purchase new house for yourself. The relations with colleagues and elders shall remain good. You shall get opportunities to share your opinion with your family members. 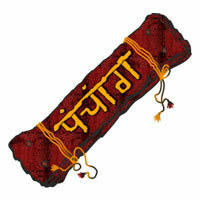 Your luck is with you so get benefited from it. You shall be successful in politics and are likely to get some high post of responsibility. Aquarius- Mars-Saturn conjunction is favourable for Aquarians. You can expect rise in financial matters with gain of reputation. Progress in destiny can be expected. You shall earn gains from abroad. You shall get losses from paternal property. Your confidence shall get enhanced which would prove beneficial for your near future. Enjoy your work and try to give your hundred percent. There shall be slight disturbance in marital bliss because of extra burden at work place. Pisces- You might remain worried about your health. There shall be obstacles in matters related to wealth, family, issues, job and gains. You are advised to be extra cautious in matters related to family and you shall have to abstain from giving importance to trivial matters. The health of children might get affected very badly. The inflow of money shall also get obstructed. You might have to face losses while going on journey. Stomach pain, toothache and injury to right eye etc. are probable. This issue of Research Journal is mainly dedicated to Share Market and Marriage. Many important articles related to these subjects have been written by renowned astrologers and numerologists. 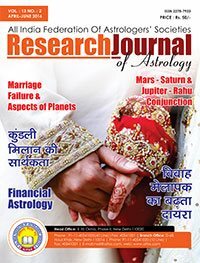 The most important articles of this issue of Research Journal contains Mars - Saturn & Jupiter - Rahu Conjunction, Marriage Failure & Aspects of Planets, Marriage Compatibility Through Numerology, Financial Astrology. Apart from many English articles there are some noteworthy Hindi articles as well. Important Hindi articles include Tezi mandi vaar aur shakun ke dwara vichar, Kaun le sakta hai share bazar se laabh, Chat shadi pat talaak, Vivah melapak ka badhata dayara etc.